Look and plan like a professional with this upscale weekly appointment book; the concealed wire binding gives it a sleek, stylish appeal; Made in the U.S.A.
13 months of planning power, January–January; 8.25 x 10.88 inch page size; 9 x 11.44 x .69 inches overall; black tri-fold cover. Quarter-hourly appointments, 7 a.m.– 8:45 p.m. Monday–Friday; 7 a.m.–5:30 p.m. Saturday; past, current and two future months reference. 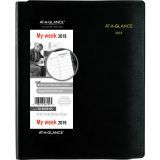 Includes storage pockets, a note pad for lists and to-do's, a page marker that helps find your day, and a pen loop that keeps your favorite pen near. 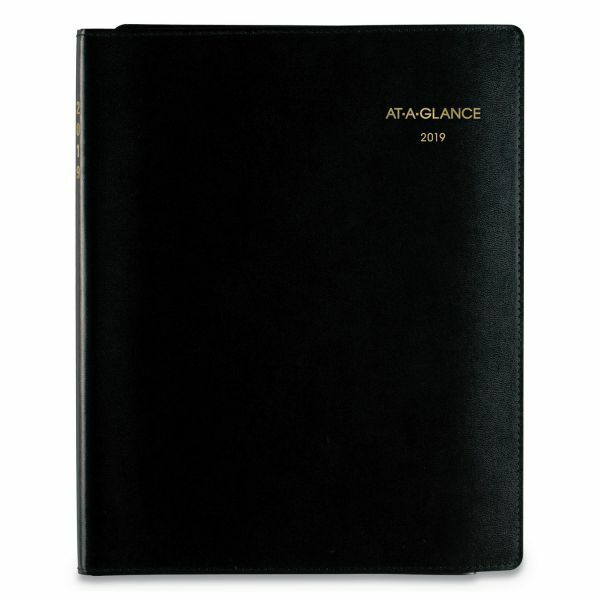 AT-A-GLANCE Plus Weekly Appointment Book, 8 1/4 x 10 7/8, Black, 2019-2020 - Make a statement and keep organized at the same time with the Weekly Professional Appointment Book. Two-page-per-week spreads range 13 months from January to January. Ideal for detailed appointments with quarter-hourly appointments times from 7 AM to 8:45 PM Monday to Friday and from 7 AM to 5:30 PM on Saturdays. Each spread includes past, current and two future months reference and Julian dates. 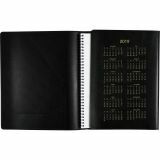 Features simulated leather cover, separate tabbed telephone/address section, writing pad, page marker flap with full year calendar reference, pen loop and handy pockets. Wire binding on appointment book is concealed. Nonrefillable. 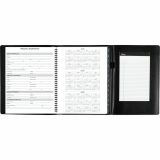 Separate tabbed telephone and address section.